Best Memphis Burger Fest has been one of my favorite Memphis events since it's first year. It was especially my favorite event this year because I was asked to participate. Last Sunday, I had the honor of hosting two slider cooking demos thanks to the Pigs Gone Wild group. 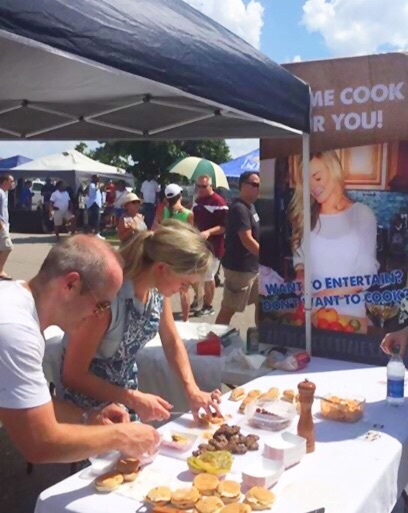 They invited me to their tent and helped me launch the first-ever cooking demo at Best Memphis Burger Fest. The first class focused on my famous Truffle Sliders, how to not over-mix meat when adding flavor, and how caramelized onions and truffle mayo can make a burger fabulous! For the second class, I made my South in your Mouth Burger (coming to Andrea's Cooktales soon) - Slider style and explained how salt and pepper is all you need to season a burger with fantastic toppings. Me and the best sous chef ever... My sweet! Making sliders for lots of folks! 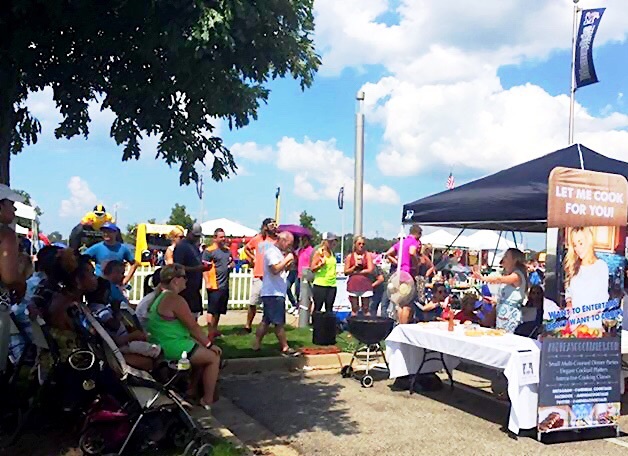 It was quite possibly the hottest day this entire summer and standing over a hot grill flipping burgers didn't help, but it was well-worth the sweat and sunburn! The crowds were great at both demos, and I had many folks approach me after each class to tell me they actually learned something. When I am teaching a cooking class, nothing makes me happier! Thank you to the best team, Pigs Gone Wild! By the way... can we all talk about why summer is "grilling season?" How on God's green earth does that make sense? I mean seriously, summer is the last season I want to even be outside, much less, standing over a hot grill. Thanks, but I'll wave summer bye in a couple of weeks and THEN start grilling. Haha! Anyway, watch my cooking demo videos and make sure you come to Best Memphis Burger Fest next year!!! It's the absolute best! The end of a long, hot day! *** A BIG THANK YOU to Jim Lord for having this idea and getting everything organized for me, and to Bill Ahern for making the best announcements that gathered people to the tent for the demos, and to Randall Audrain, Zach Kennedy, Ryan Graves, Brandon Becker, and everyone at the Pigs Gone Wild tent... yall rock!!! And a HUGE THANK YOU to Seth Agranov, one of the founders of this great event - there would be no Best Memphis Burger Fest without him! !